Walter Franklyn Barrett (1873-1964), film cameraman and director, was born at Loughborough, Leicestershire, England. He moved to New Zealand around 1895 working as a clerk but in his spare time started experimenting with the new technology of moving film. He filmed documentaries in Australia and New Zealand. Among his filming assignments was the visit to Australia in 1901 of the Duke and Duchess of York. In 1904, Barrett made the first complete film of the running of the Melbourne Cup and was commended by Pathe-Frere for his work in photographing racehorses in full gallop. He started his professional film career in the Melbourne offices of Pathe-Frere, in 1908, as a newsreel cameraman, and filmed The Sea Coasts of New Zealand and in 1909-10 South Sea Island Films. Among his great successes were The Pioneers (1916), The Monk and the Woman (1918) and Know Thy Child (1921). Although the plot of The Breaking of the Drought (1920) was old-fashioned, Barrett's realistic photography of the drought scenes was praised by the critics and led indirectly to the tightening of Commonwealth censorship laws. He married Mabel Muriel Pile in Perth on 10 December 1906. They lived in Barrett House. Lionel Frost Bowen was born at Ultimo in Sydney on 28th December 1922. Educated locally, he left school in 1936 aged 14. He later matriculated at night school. Lionel Bowen studied law at Sydney University and practiced as a solicitor in Sydney before becoming a Federal minister in 1972. In 1948 at the age of 25, Lionel entered local government. He served as a West Ward alderman on Randwick Council until 1962. During this period he was mayor twice, in 1951 and 1955. One of Mr Bowen's major feats in local government was his, and fellow alderman Harry Jensen's, success in seeing Windgap School for the Intellectually Disabled established at Coogee in 1954. In 1962 Mr Bowen was elected to the NSW Parliament and served as MLA for Randwick until 1969, when he transferred from State to Federal politics when he was elected as MHR for Kingsford-Smith. For the next twenty-one years Mr Bowen represented the Kingsford-Smith electorate in Federal parliament and during that period held a variety of positions both in government and opposition. Between 1972 and 1975 he served in the Federal Labor government as Postmaster-General, Special Minister of State and Minister for Manufacturing Industry. During this period he led the first Australian Parliamentary delegation to the Peoples' Republic of China following Australia establishing diplomatic relations in 1972. In 1977 Mr Bowen was elected Deputy Leader of the Federal Parliamentary Labor Party. Following Mr Bowen's election as Deputy Prime Minister of Australia and minister for Trade in 1983 he led trade missions to Bahrain, Kuwait, Egypt and Saudi Arabia, Cyprus, USA, China, Brazil, Italy, Czechoslovakia and Bulgaria. In 1985 he relinquished the Trade ministry to become Attorney-General and Minister assisting the Prime Minister in Commonwealth-State relations. In 1991 Lionel Bowen was made a Companion of the Order of Australia in recognition of his service to politics and the community.In 2001 he was awarded the Centenary medal for service to the community. Lionel Bowen's ministerial responsibilities as Attorney-General included constitutional reform, human rights, legal services to government, family law, consumer affairs, censorship, legal aid, business practices, copyright and bankruptcy. He was Minister responsible for national security matters involving A.S.I.O. Lionel Bowen retired from Federal parliament in March 1990. Lionel, with wife Claire, lived with their five sons and three daughters in the Kensington house he was brought up in. Lionel Bowen died at home on April 1, 2012 aged 89 years. More than 1000 people gathered at St Mary's Cathedral, Sydney for the State Funeral to say farewell, with state and federal politicians past and present from all sides of the political spectrum in attendance. The Bowen Library, named in appreciation of the contribution Lionel Bowen has made to the local community, was officially opened on Sunday 25 August 1991, and renamed the Lionel Bowen Library in 2016. Herbert Dudley was one of Randwick's greatest real estate agents and developers. He opened up large areas of land south of Maroubra for residential and commercial use. His slogan was "Watch Maroubra Grow". Herbert Dudley was born in 1869 to Arthur and Annie Dudley. He was the eldest of four boys. Dudley left school at the age of 14 and worked as an apprentice draper at Farmers and Co. He maintained a good relationship with the owner of Farmers and Co., John Pope, who helped Dudley to buy his first block of land. Dudley's first connection with the Randwick city area began in the 1890's after his family bought a holiday home in the village of Brand (now Malabar).Dudley moved to Dacre Street, Long Bay (next door to his parent's house) in 1903. He built Dudley's Emporium on the corner of Anzac Parade and Maroubra Road, Maroubra Junction in 1912 / 1913. The emporium included a cinema, produce store, hardware and grocery store, drapery, refreshments, chemist, butchery and residence. He also built a wooden school (now Maroubra Junction Public School) in the following years. Dudley was responsible for organising the tram line to be extended to Maroubra Beach, and for the first doctor and dentist to operate in the area. He also lent "Dudley's Pavilion" in Ireton St, Malabar to local church groups free of charge. Herbert Dudley died in 1927 at the age of 57 and is buried at Randwick Cemetery. Jean-Francois de Galaup, Comte de La Perouse (La Perouse) was born near Albi, France on 22 August 1741. He was a naval officer and an explorer. In 1785, the King of France, Louis XVI, inspired by Captain Cook's explorations, commissioned La Perouse to lead an expedition to explore the north and south Pacific region. La Perouse was provided with two vessels, La Boussole and L'Astrolabe. He was the commander of the La Boussole. On both ships he was accompanied by the crew, soldiers and a group of scientists, including astronomers, botanists and zoologists. During the following three years they mapped much of the Pacific region. The group sailed from Brest in August 1785, rounded Cape Horn and sailed to Alaska via Easter Island and the Sandwich Islands (1786). From Alaska, La Perouse sailed down the west coast of America in July 1786 to California and made his way over the Pacific to China. He reached China in January 1787 and then proceeded to the Philippines and Japan. In December in 1787 La Perouse reached Samoa. In Samoa the commander of L'Astrolabe and eleven of his men were killed by local inhabitants. La Perouse sailed on to Botany Bay and established a camp on the northern shore on 24 January 1788. This is the area now known as La Perouse. Captain Phillip and the First Fleet had landed there six days earlier. During his six week stay, La Perouse maintained cordial relations with Phillip, who had moved on to Sydney Cove. Contact between the English at Sydney Cove and the French at Botany Bay was made possible by using an existing aboriginal track. This track was named the "Frenchman's Road" and is part of the existing Frenchman's Road. Prior to his departure, La Perouse handed over letters and journals to Phillip. These were sent to France. Thus records remain of the voyage to Australia and were published in 1797 ( Voyage Round the World ). A commemorative monument to La Perouse was erected on the landing site by Captain H de Bougainville in 1825. La Perouse left Botany Bay on 10 March 1788 and was never heard of again. Antoine d'Entrecasteaux was sent from France in 1791 to search for La Perouse but failed to find any trace. In 1826, Peter Dillon found European relics on Vanikoro Island in the Santa Cruz group. He revisited the area in 1827 and came to the conclusion that La Perouse's two ships had become wrecked on the island. He theorized that some of the crewmembers were massacred when they landed on the island, while others may have used the wreckage to build another boat and sailed away. Acknowledged in his time as the world's greatest aviator, Sir Charles Kingsford Smith was born on 9 February 1897 in Brisbane. When he was 18, he enlisted in the Australian Imperial Force. During WWI, "Smithy" served at Gallipoli, in Egypt and in France before transferring to the Royal Flying Corps where he discovered his great passion for flying. For his gallantry in the skies over France, when he was just 20, he was awarded the Military Cross. After his service, "Smithy" went on to become an extraordinary pioneer of civil aviation and air mail routes. He created more flying records than anyone else in the world at that time and quickly became a national hero. "Smithy" was awarded a knighthood in 1932 for his services to aviation. He was admired globally for his courage, daring and sense of adventure. In 1935, during a flight from India to Singapore, Kingsford Smith and his co-pilot John Thompson Pethybridge went missing. Despite a search, their bodies were never discovered. His untimely death at 38 was a great loss to the nation. In 1936, "Kingsford" was chosen from a competition sponsored by the Chamber of Commerce, naming this suburb in honour of Sir Charles Kingsford Smith. In 1990 Randwick City Council commissioned the Southern Cross Mural by Lloyd Kellerman in a popular thoroughfare called Southern Cross Close located adjacent to Anzac Parade at the end of Gardeners Lane. A mosaic by David Humphries depicting Kingsford Smith was installed in the same laneway and unveiled by Councillor John Procopiadis, Mayor of Randwick on 11 August 2010. The mosaic was produced with support from Randwick City Council, Public Art Squad, Commonwealth Bank of Australia, Kingsford Chamber of Commerce (President Peter Schick) and the mosaic was directed by David Humphries and designed by Masoud Nodous and artist Tim Cole. On 21 June 2014, Councillor Scott Nash, Mayor of Randwick officially unveiled an updated and extended mural by artist Annette Barlow complementing the 2010 and 1990 artworks. The mural was commissioned by the Kingsford Chamber of Commerce with support from Council and Randwick Rotary. June Moore (1919-2011) was a passionate advocate for the preservation of heritage in the City of Randwick. This did not come as a surprise to those who knew her mother, Nell Pillars, the founder of the Randwick and District Historical Society. Nell's daughter June, had a long, devoted association with Randwick and was a great promoter of its history. She was a founding member of the Randwick and District Historical Society in 1957. June was president of the society for two years in 1979 and 1980 and honorary secretary 1961-65, 1968-76 and 1983-88. She was made an honorary life member of the society, in recognition of her contribution to the preservation of our local history. In 2001, she received the Centenary Medal for services to the community, preserving local and built heritage. Without the passion, dedication and enthusiasm of residents such as June Moore, much more of our local heritage would not survive today. A brief chronology of her involvement with the Randwick and District Historical Society shows her commitment to our heritage. In 1959, shortly after the foundation of the society, June helped organise a heritage display for the Randwick Council centenary celebrations. By 1963, the Bare Island Fort Museum was established, when the War Veterans' Home was relocated. From 1963-1967 June and her family became resident caretakers of the museum. The museum housed much of the Randwick and District Historical Society collection. At its peak, this museum had over 1000 visitors per week, including school children and overseas visitors who were educated, informed and entertained my the museum displays arranged by June and other society volunteers. By 1976, the Bare Island facility was closed, due to structural problems with the building, such as rising damp, and its growing unsuitability for storage of heritage objects. June campaigned for the historical society to be accommodated in another historic Randwick property, Sandgate, in Belmore Road. This became the society headquarters from 1986 until they moved to rooms in the Randwick Town hall during 1991. Perhaps one of June's greatest achievements was her contribution to the preservation of Blenheim House, first Mayor of Randwick Simeon Pearce's home in Blenheim Street Randwick. June, co-founder of the Friends of Blenheim House, bought her energy and enthusiasm to a long and protracted campaign to save this property. Her involvement in the fight to save Struggletown in the 1980s, is a similar example of her determination to fight and save our local heritage. June is remembered by long standing society members as having an ability to maintain positive contacts between the society, Randwick City Council and key local residents who had the professional skills to assist the society in their work. She was a great manager of the army of volunteers who man the society's research collections on a weekly basis. June was always researching aspects of local history, and campaigning. It is said of those who knew her,that June thrived on a crisis. June was ever a keen researcher of local history. Along with artist, Albert Clarke, she started the tradition of the Randwick Rambles, (history walks) establishing the historical society's tradition of publications that continues to this day. June Moore passed away in August 2011. June is survived by her husband Milton, and four daughters Orel, Shelley, Kylie and Alanna. Simeon Pearce is known as the Father of Randwick. He was instrumental in the formation of the Randwick Municipality and was Mayor for the first ten years of it's life from 1859-1968, returning a second time in 1882. Simeon Pearce was born in the little village of Randwick, Gloucester on 27 January 1821. In 1841 he immigrated to the colony of New South Wales with his cousin Samuel and in 1844 made his first visit to an area then known as the Coogee Hills. In 1847 he purchased a 4-acre lot in the Coogee Hills from George Hooper intending to go into business as a market gardener. He called his small estate "Randwick". In 1848, soon after marrying Alice Isabella Thompson, Simeon borrowed money from George Hooper to build a substantial residence on his property. It was the first stone house in the area. He named the house Blenheim House and it is still standing today. From this time on Simeon dreamed of creating a village on the model of Randwick in Gloucestershire. In 1849 he was appointed Commissioner of Crown Lands, an influential position that gave him the power to control the sale of land in the district. Whilst in this position Simeon began to purchase the best parcels of land in the area. These were later re-sold, earning him immense profits. With his brother James who immigrated to Australia in 1848, and access to his wife's inheritance, he was able to finance further purchases of land in Randwick. At one time the brothers owned nearly all the land in Randwick including all of Struggletown. As Commissioner of Crown Lands, Simeon was in a position to promote the district to prominent members of Colonial Society, and was instrumental in developing the suburb of Randwick. The formation of the Old Botany, Randwick and Coogee Road Trust led to the improvement of roads into Randwick, and people began to move into the area. To further promote the area to leading members of colonial society, Simeon and his wife hosted fox hunts in the Randwick and Maroubra districts. Simeon Pearce played a principal role in the formation of the Society for Destitute Children, securing the land for the Children's Asylum building in 1854. The Society was the fashionable charity of the day and attracted rich and influential patrons. Towards the end of the 1880s Simeon Pearce embarked on the struggle to have Randwick incorporated as a municipality. A petition was raised and despite protests by neighbouring Waverley residents, the incorporation of the municipality of Randwick was gazetted. This was due in part to the influence of Simeon's highly placed contacts. On 22 February 1859 he was elected as the first Mayor of Randwick. He continued as Mayor until 1868, holding the office once again in 1882. Simeon Pearce was the driving force behind the building of St Jude's Church, which was modelled on the church in his home village. The building of the church was funded by a bequest. The controversial location of the church was decided in a court case, Randwick being chosen due to Simeon's influence. The foundation stone was laid on 25 May 1861, the church being completed in and officially opened in 1865. The Stuggletown settlement was established on land owned by Simeon and his brother James. Originally developed as market gardens, stone cottages were later built for employees and their families. The cottages guaranteed the employees accommodation, whilst assuring Simeon steady rental income. During the 1870s to 1880s, Simeon pressed for improved services to Randwick. He lobbied for land for Randwick Cemetery and campaigned to have the Eastern Suburbs railway line extended to Randwick. Simeon Pearce died in 1886 after suffering his second stroke. He was survived by his wife and six children. Brendan O'Keefe, Simeon Pearce's Randwick: Dream & Reality , New South Wales University Press, 1990. 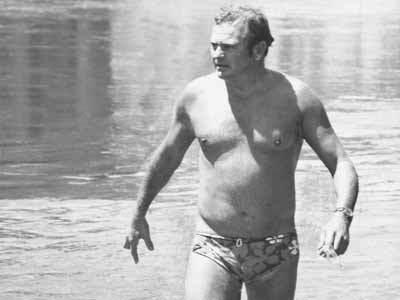 Des Renford MBE (1927-1999) was a renowned Australian marathon swimmer. Des successfully swam the English Channel 19 times from 19 attempts. This feat remains an epic achievement in Australian sporting history. In the 1970s he held the title of King of the Channel. His rivalry with two Britons, Kevin Murphy and Mike Read, have become part of the folklore of the sport. In 1977, Des and Kevin agreed to three races against one another. Kevin won the first – 10 miles in shark cages in Sydney Harbour. Des won the second – a Channel crossing. On the last race, the length of Loch Ness, where the temperature was at times near freezing, Des was pulled from the water after six and a half hours suffering from hypothermia and taken to hospital. Although Kevin went on another two and a half hours, he also failed to complete the course. Des grew up in and lived in Maroubra his whole life. He was a butcher, a barkeeper and a bookmaker. But Des is perhaps most well known for his association with what is now known as the Des Renford Leisure Centre - the former Heffron Pool was renamed in his honour on 1 March 2000. He trained at the Centre, spending countless hours in the pool and he generously donated to the Special Olympics group. He also formed a Coffee Club to give people of all swimming abilities the opportunity to swim and share a cup of coffee together. Both of these groups still operate within the Centre today. John See was born in Yelling, Huntingdonshire, England on the 14th November 1845, the third son of farmer Joseph See and his wife Mary Ann Bailey. The family migrated to NSW when John was aged six and settled on a farm near Maitland. It was at nearby Hinton that John received the only formal schooling he was to have. In 1862 John and one of his brothers moved to Southgate, on the Clarence River east of Grafton, where they pioneered farming in the area. Farming was a hard life for the See brothers and after only 4 years John moved to Sydney to become a produce merchant and shipping agent, eventually moving into coastal shipping. It was in shipping that he made his money, establishing the North Coast Steam Navigation Company, maintaining links with the Clarence Valley through the shipping business. John See married Charlotte Matthews at St Jude's Anglican Church Randwick on the 15th March 1876. He built his home, a mansion called "Urara", at Randwick, and proceeded to produce a happy family of ten children. Not long after his marriage See became involved in local politics, serving as an Alderman on Randwick Council from 1878-1890. He served 3 terms as mayor, in 1880, 1881 and 1886. Council elections in Randwick were often not contested so See's introduction to the rough and tumble of politics was quite gentle. Despite his devotion to his large family See found time to involve himself in a number of commercial enterprises and voluntary organisations. He owned John See and Company, and the North Coast Steam Ship Company, as well as serving as a director of (among others) the Newcastle and Hunter River Steam Navigation Company, London and Lancashire Fire and Insurance Company, and W.H. Soul Pattinson Company. In a voluntary capacity he served as a director of Sydney Hospital, trustee of Cook's Landing Place at Kurnell, trustee of the Sydney Cricket Ground, and president of the Royal Agricultural Society. In 1880 See became member for the new electorate of Grafton, a position he was to hold until the electorate was abolished in the redistribution for the 1904 election. In terms of his politics See was seen as a supporter of "fair trade" and as a real local Member of Parliament, supporting local issues and showing concern for issues affecting his constituents. His experience in the business world was valued by his political colleagues. See fought hard for a Grafton to New England railway, which although approved was never built. Other efforts to improve country transport were more successful, including the construction of the Grafton to Tweed rail line. John See was appointed state treasurer in 1891, becoming a "Protectionist" during a time of political turmoil and economic depression. He became Premier on 28th March 1901 and was knighted in 1902 as part of the Coronation honours. He was a member of the Masonic Lodge but was not attracted by sectarianism; he was known as being an amiable person with an accommodating personality, and was often seen to be upset by attacks on him in the press. See resigned as Premier in 1904, citing poor health as the reason for his decision. He was devastated by the death of his wife in 1904, and it is thought that he may have suffered a nervous breakdown. See died on 31st January 1907 at his home in Randwick, from heart failure, and was survived by four sons and three daughters. His estate was valued for probate at 167,372 pounds. He was buried in the Anglican section of Randwick Cemetery. See's daughter Charlotte married (Sir) Samuel Hordern in 1900.